Soooo, that was an awkward and unintended break from blogging. My last post was about two weeks ago, which is at least one week too long ago. Truth be told, things have been pretty busy around here. Let's see, I took a quick birthday trip to The Bahamas, I quit my job (I'm starting a new one soon! ), I went to three concerts in the span of 5 days, and I've been traveling back and forth to Pennsylvania as I wrap up my current job. I've literally spent 3 nights in my own apartment over the past 2 weeks. But things are coming together and soon I'm going to have a crap-ton of time for this blog! Or at least more than I've had in the past two weeks. Did you come here to hear about all this? Maybe. But I know for sure that you're here for these pancakes. Who doesn't love pancakes!?!!?! (If you don't, now may not be the time to speak up. Just go with the flow.) 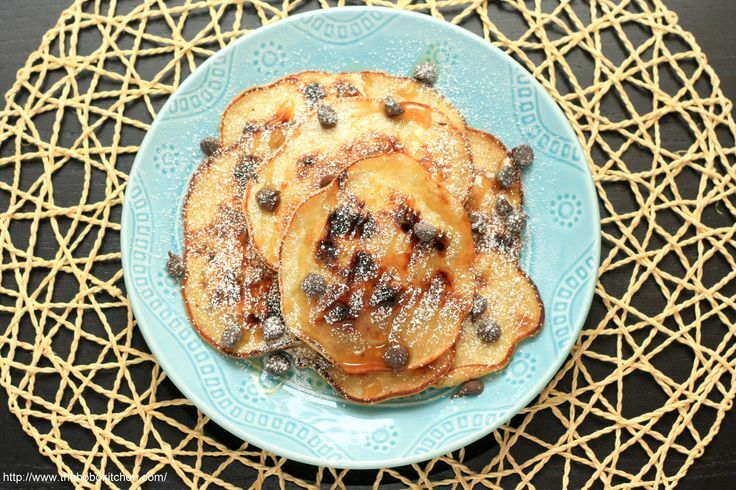 These pancakes are special because they have bananas and chocolate chips. So they're good for you with just a hint of bad. Though I'm sure you can rationalize that a little bit of chocolate is good for you. I've got your back on that. I'm going to keep this post short and sweet today. I'll definitely have many more recipes to share in the near future. And guys...PUMPKIN SEASON IS COMING!!! Prepare yourselves! I used to drag myself out of bed with the promise of a cup (or two) of coffee. It worked every time. Lately, though, I've been waking up voluntarily at 7:30am just to get a jump start on the day. This is insane! Am I becoming a morning person? I don't even know me anymore. When I came across this recipe for coffee pancakes on Pinterest, I knew it was something that I would need to make. As you can see, I already have an excellent relationship with coffee. Now that it seems I have some extra time in the mornings, I can even whip up some pancakes! These pancakes were so easy to make and so tasty. The coffee flavor definitely shines in these. Of course, I did use instant espresso granules instead of the instant coffee granules which were recommended in the original recipe, but that's just me. Go big or go home! OK, you're probably already home if you're making these. Oof. Never mind. Too much coffee. Just make these! My life has been forever changed by these pancakes. I seriously thought these Sweet Potato Pancakes were the end game for pancakes forever. But now I see that they have been trumped. Just to let you know, this is just my personal opinion because I will always (always!) be swayed by chocolate, so take this as you will. A few months ago, when I knew I was going to take some time off, I pulled together a list of several recipes that I definitely wanted to try while I was on what I call "vacation". Last week, I realized the list is only, maybe about 75 recipes long. Um, I don't even have 75 days off. Plus, at least 24 of those days were/will be spent on crutches. Clearly that's not the optimal time to play around in the kitchen right next to open flames and a 350 degree oven. That is akin to asking for a trip to the ER. So anyhow, I got real and decided to pare this list down to the things that I really actually wanted to make. Enter these brownie pancakes. These were one of the first things I had pulled into my To-Make list and I had forgotten about them. Um, no. I needed to make these. I pulled this recipe to the top of the list and got to work. And before everyone starts freaking out about eating brownies for breakfast, please note that this can be made into a "skinny" recipe...aka 172 calories per serving, which happens to be the ENTIRE RECIPE. No joke. I don't joke about brownies. Now, I didn't have all the required ingredients on hand, so my recipe will not have this many calories, so if you do want to pare things down a bit, I provided the link to the original recipe for ya. I need to preface this post by saying that I do not prefer pancakes. To really emphasize this point, I will have you know I have not made pancakes since I was living at home. In the Bahamas. When I was 16. I will eat pancakes, but usually they're stuffed with chocolate chips. I like chocolate a lot. Another thing that I'm not a big fan of is maple syrup, which makes the whole pancake thing sooooo much more difficult. I sort of stumbled into making these particular pancakes. I actually wanted to make waffles with leftover sweet potato puree. However, such an endeavor requires a waffle maker. That would be one of the items that is absent from my kitchen, so I decided I'd just convert my waffles into pancakes because really, it couldn't be that difficult. And it wasn't. The batter ended up making pancakes that smelled and tasted like spices and autumn. The texture of the pancakes was light and fluffy, which reminded me of cake. You all know how much I love cake...cupcakes specifically, but I'm not too picky. I ate these for brunch. I ate these again for dinner. And then I ate them in between meals as a snack. Since I've already mentioned my sort-of-dislike of maple syrup, I decided to drizzle these with honey. Who knew and didn't tell me? Seriously. Honey is the new maple syrup. I can't go back. I am in love with honey on any given day. But when it's poured on top of sweet and savory pancakes...let's just say that things got real up in this kitchen. It's time once again for my monthly Secret Recipe Club post! This month I had the pleasure of checking out The Double Dipped Life, which belongs to Krista alllll the way in Utah. I had a great time looking through the recipes on Krista's blog. Maybe I was just really hungry this month. That wouldn't be unheard of. 1) Shut up that this recipe is from Betty Crocker. The Betty Crocker Cookbook is one of the first cookbooks I remember leafing through. Ever. My mom had an old cookbook that my sister and I would use when pretending to serve in our very own restaurant, complete with paper food cutouts that we made ourselves. 2) Hellooooo! Fall recipe! Between the apple and the spices, I'm not sure what exactly I was more into. Maybe the apple. No wait, maybe the spices? Oh hold up, brown sugar's in here too? 3) Can I get an amen for breakfast as lunch/dinner? I love breakfast dishes but I don't love eating a meal early in the morning. Of course, I then spend the day trying to squeeze breakfast into my other meals. 4) Finally, this recipe was laid back and easy. Just my style. It took no time to whip together all the ingredients and produce this huge, tasty pancake. 1) Preheat oven to 375 degrees F. Place the butter in a pie dish, and place it in the oven to melt for about a minute. Once the butter is melted, use a pastry brush to brush the butter up the sides of the dish. 2) Sprinkle the brown sugar, cinnamon, and nutmeg on the bottom of the pie dish. 3) Place the apples on top of the sugar and spices. 4) In a medium bowl, beat the eggs lightly. 5) Add in the flour, milk, and salt. Stir until just combined. Don't mind the lumps you see. This is OK! 6) Slowly pour the batter on top of the apples. 7) Put the dish in the oven and bake for ~30 minutes, or until the edges are browned and puffy. 8) Remove the dish from the oven and immediately run a spatula around the edges to loosen the pancake. Flip the pancake onto a plate. Sprinkle with powdered sugar, or serve with maple syrup or whipped cream. This pancake seriously reminded me of the french toast I made growing up. My sister and I would make a brown sugar and cinnamon topping to sprinkle over freshly made french toast. The biggest difference was that this "french toast" has apples in it. The sweet and spicy pancake is nicely balanced by the crisp, fresh apples. This is not a heavy meal, which I love because that means I can eat all of it by myself and not feel too guilty. Not that I would do anything like that.